... I requested that he play DeFalla’s Nights in the Garden of Spain since I am familiar with the LP. While there was good tonality to the strings and the performance was involving, overall the sound felt a little dark and shut in. 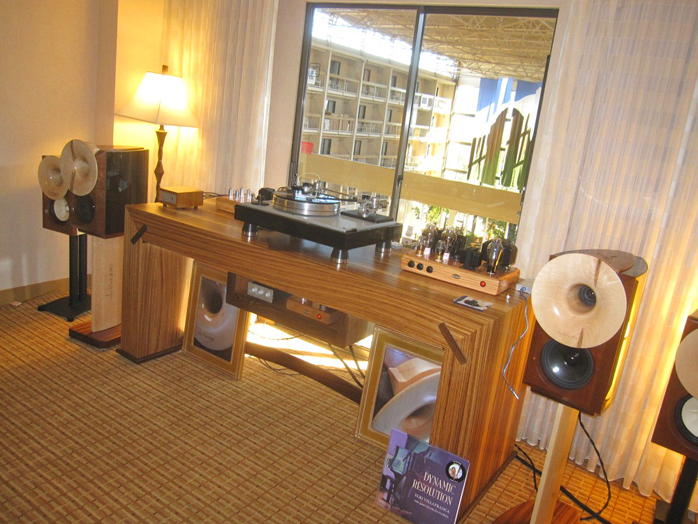 I suspect that this room’s corners were not doing the trick for the AN speakers. Analog Domain Audio GmbH – Goebel High End, Stahl-Tek LLC, Purist Audio Design. Wow, this $175.000/pr Goebel HighEnd Epoque Reference was one odd-looking speaker using a flat bending wave driver from 180Hz to 30kHz. I’ve never heard of such a thing [Manger, German Physik and Naim are just a few other companies with their own take on such drivers - Ed]. It was flanked by four active woofers, two in front and two in back and eight passives. With the Stahl-Tek CD front end which I think may be the best Redbook playback out there, the sound was captivating. The speed and dynamics of this system were mesmerizing. Dean’s Jim King CD sounded great with my only desire being perhaps a bit more warmth on his voice. Vapor Audio, B.M.C. Audio. 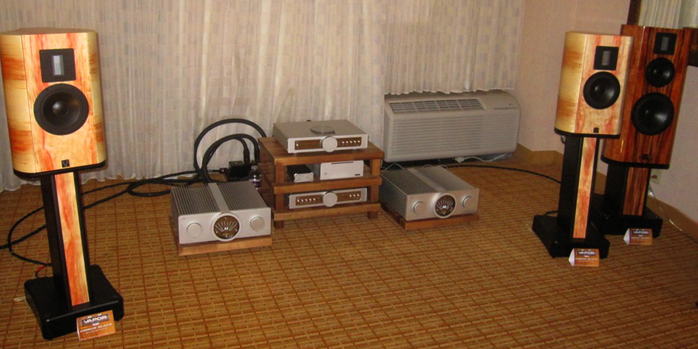 Vapor Audio showed a few of their speakers paired with B.M.C. 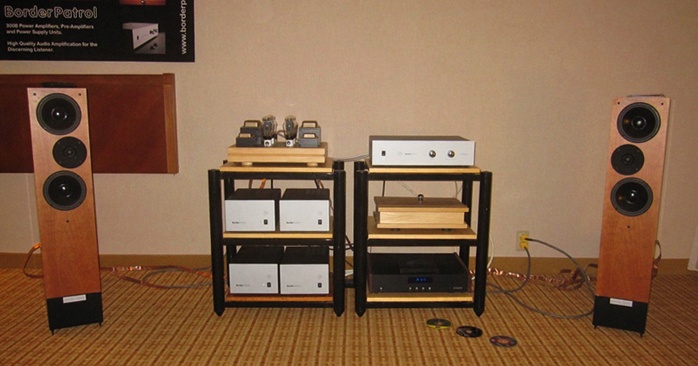 Audio electronics, an Antipodes Music Server and HB power distributor and cabling. 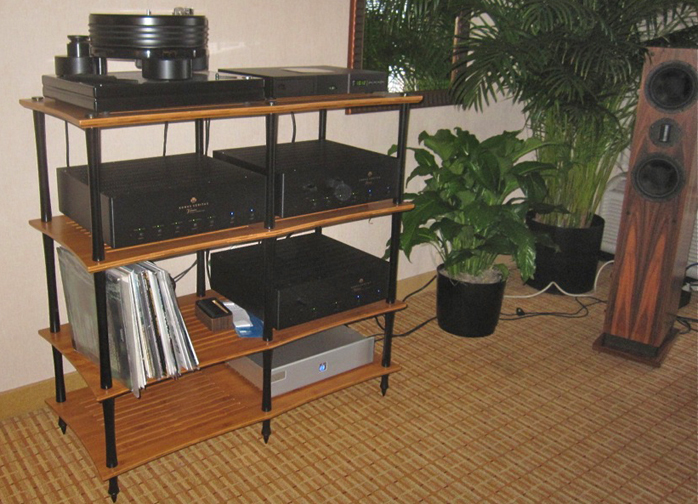 I heard the smaller Vapor Audio Cirrus Black loudspeakers ($3.995/pr). The larger Joule Black are $8.995/pr with stands. Flamenco music sounded nice with rich tone. The bass was clean and the speakers were very open. The RAAL ribbon tweeter is very highly regarded yet I could hear its distinct character standing out ever so slightly – hardly a major flaw but something I am often able to pick out. ... powering the DeVore Orangutan two-way wide baffle speaker which are a throwback to vintage designs. With their wide baffle, the lower mids wee nicely fleshed out and midrange presence was of the highest order. With the music played at the time, I did not hear much soundstage depth however. ... Gary Dews, owner and designer of Border Patrol electronics, manned the room. His S20 EXD 18wpc 300B parallel single-ended with Control Unit EXT1 line stage and NOS DAC1 prototype (available to order) drove the top-line Living Voice Avatar OBX-RW with external crossovers to sound simply sublime on a Louis Armstrong cut. 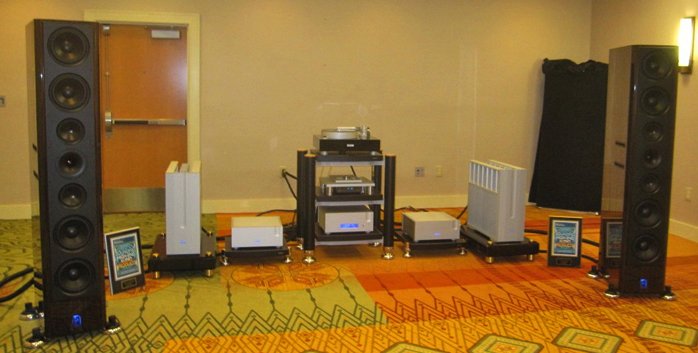 This system had the best timbre of any system I heard at RMAF and certainly was among the best I ever heard. This quality gave it such a realistic feel and disarming musicality that I found myself considering switching to these speakers and possibly the DAC too. Reading some other show reports, one commented that the system got boomy at higher SPLs. That may be true but is very likely room dependent. 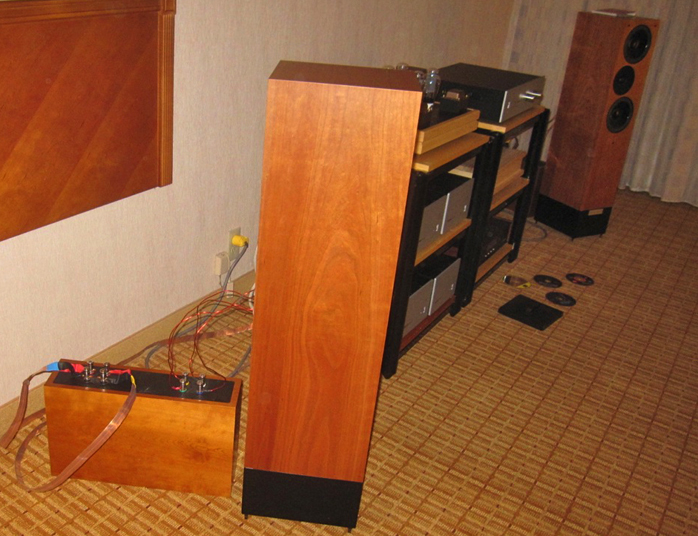 This system oozed old world craftsmanship and long-term listenability. High Water Sound – Cessaro, Tron Electric, TW-Acustic, Silent Running Audio. I just love visiting Jeffrey Catalano’s High Water Sound room as you can be assured of hearing great music. I’d hang out there for hours if I could. Jeffrey had the Cessaro hornspeakers again but this time with a brand-new very pricey Tron Discovery 300B SET amp. Jeffrey also changed to Prana Wire, which I reviewed and was mightily impressed with. I think the sound in Jeffrey’s room was the best I have yet heard him produce and I would not be surprised if the Prana Wire had something to do with it. I heard the Sheffield Harry James LP and the slight shoutiness in the upper midrange from last year was gone. Jeff also played the Rodrigo Y Gabriela LP and as one would expect from a horn midrange, the guitar work was blazingly fast with great presence. Sanders Sound System. 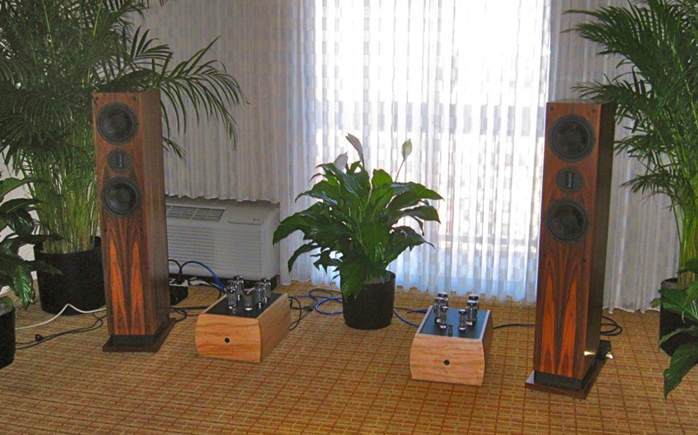 Roger Sanders is one of the great names in electrostatic speaker design and his latest Model 10C ($13.000/pr) was demonstrated in a smartly set-up room where all of seats were in a line in the sweet spot. I heard Patricia Barber’s Café Blue and the speakers did not wimp out on the explosive percussion. 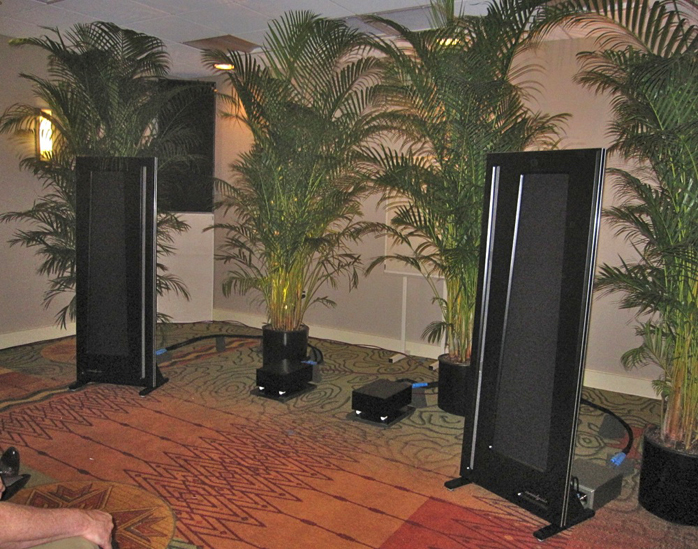 It made for one very impressive demo and the best electrostatic sound I heard since way back when a Martin Logan Statement reproduced the crack of lightning strikes in a large auditorium. Hsu Research. 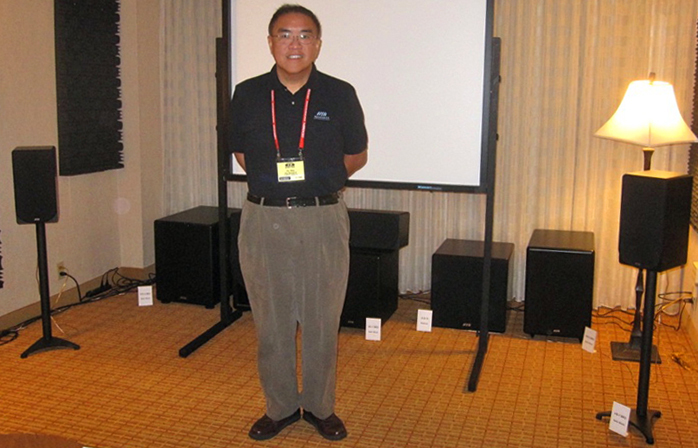 Dr. Hsu has done it again with an incredible value speaker, the HB-1 priced at $149/ea. 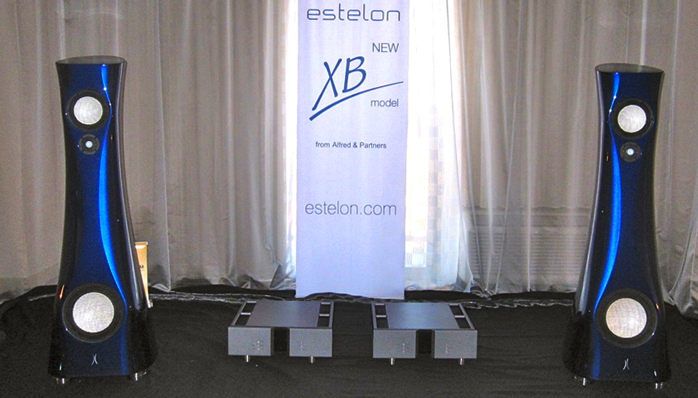 These were set up with the ULS-15 subwoofer and the soundstage these inexpensive speakers produced was wide and seamless. It reminded me of the days of the NHT Super Zero and Super One. These Hsu are very musical and forgiving and not offensive in any way. These are the go-to recommendation for cheapskate friends wanting to put together an inexpensive stereo or home theater system. They get my vote for best value speaker of the show. ... While this ceramic cone model may not have had the ultimate refinement and transparency of the diamond cone model, it seemed to be more forgiving…. or the associated equipment was better matched? 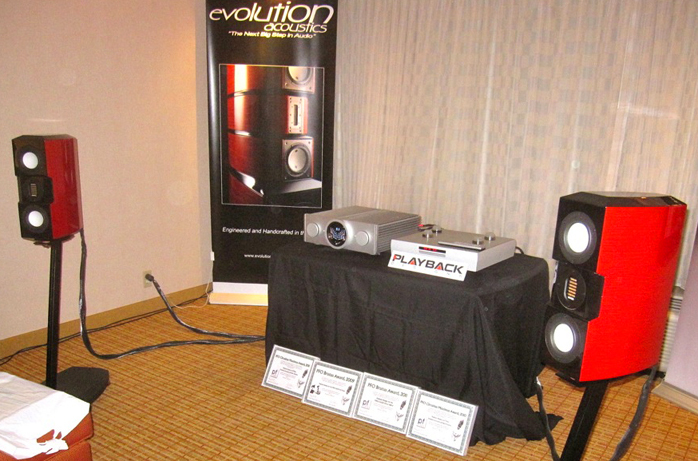 Evolution Acoustics, B.M.C. Audio, Pugent Sound Studios. 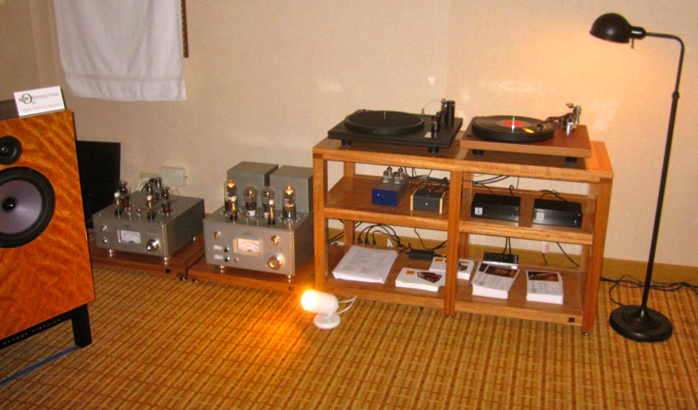 Led Zeppelin’s Stairway To Heaven spun on an Ampex ATR-102 open-reel tape deck when I entered. I read that Pugent Sound Studios provided 15ips master tapes so I assume that's what I heard through the wonderful little Evolution Acoustics MMMicroOne 2-way monitors ($2.500/pr). Amplification was by B.M.C. Audio’s CS2 integrated amp. I heard none of the edgy quality from their higher model last year when I played the Cassandra Wilson "Red River Valley" cut. These little speakers put out a lot of sound and held up well under the high dynamics and sheer volume at which they were being played. I’m not sure how they perform at lower volumes because I only heard them at high volumes. I’m voting them best mini monitor of the show. 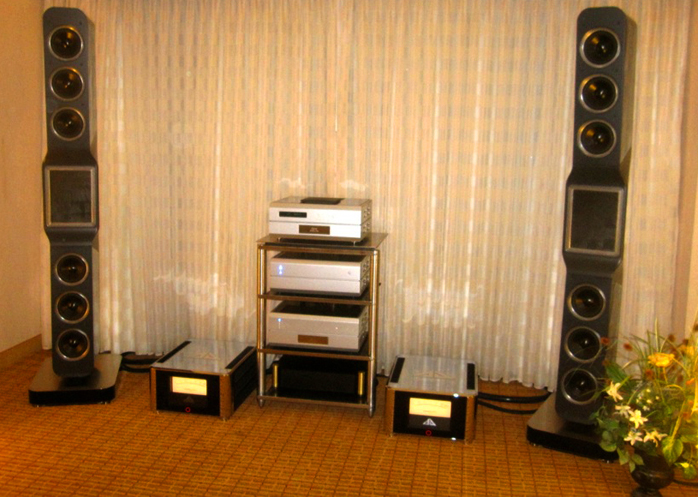 High-End Electronics Inc. - Voxativ Acoustic Technologies, High End Novum, Valvet, Synergistic Research, KR Audio. I voted the Voxativ Ampeggio the best high-efficiency speaker of last year’s RMAF. This year the Voxativ room was smaller. 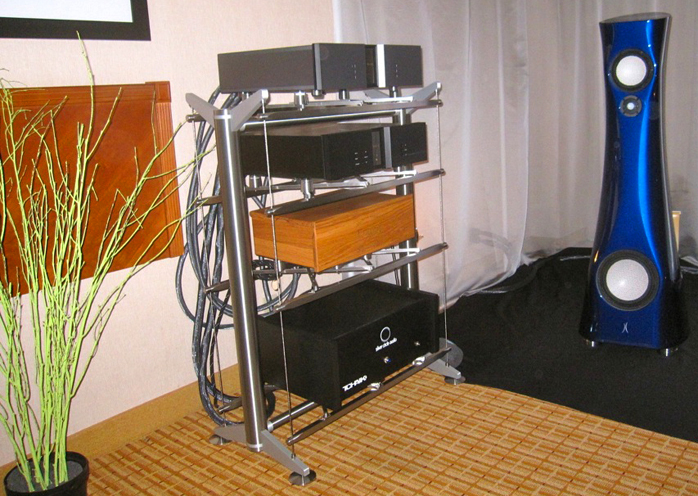 Associated components included Highend-Electronics' MusicServer1 ($995), Synergistic Research The Music Cable DAC ($3.600 with USB and interconnect cables), KR Audio P-130 preamp with KR05 tubes ($4.950) and the KR Audio Kronzilla SX power amp with T-1610 tubes ($17.550). 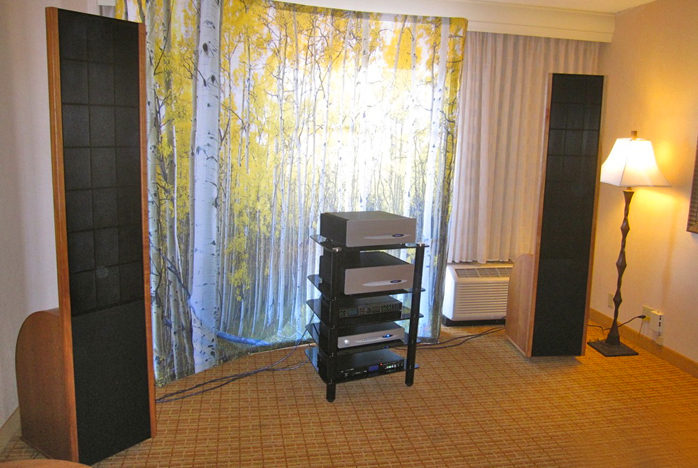 Synergistic's Acoustic ART System, Element cabling, PowerCell 10 SE MkIII ($5.500), Audio Magic Ground Disrupter ($700) and the HighEnd Novum PMR Premium room acoustic treatment ($2.320) rounded out the setup. Playing Jacintha’s "Georgia On My Mind", the speakers were very lively with tuneful if not overly weighty bass. I noted a little glare on the sax though. I think last year’s setup was superior. ... To my ears this ribbon tweeter did not need taming. I was also happy to see a Nottingham Analogue turntable although I don’t think Nottingham Analogue was official part of the room sponsors. I have owned a Nottingham Analogue Mentor with Ace Anna tonearm for 14 years. I had a rather lengthy chat with Kevin Karter and a Nottingham dealer about the questionable status of their current US representation. In the process I didn’t get to do a lot of listening. However the little I heard was promising. 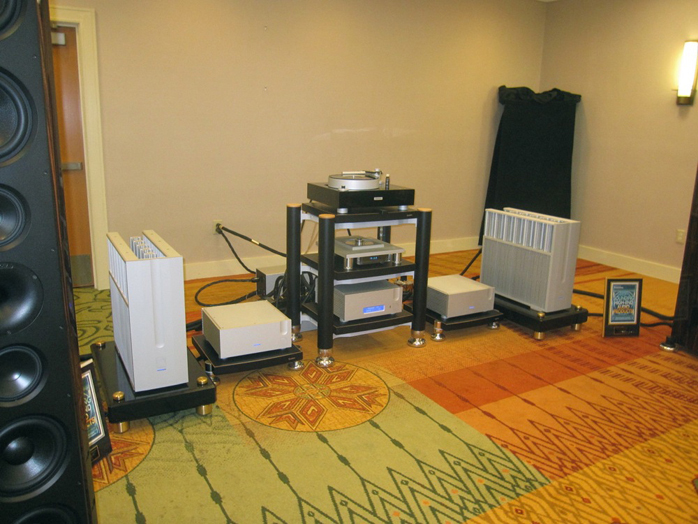 Robyatt Audio, Miyajima Labs, dc10audio, Tektron-Italia, TelWire. 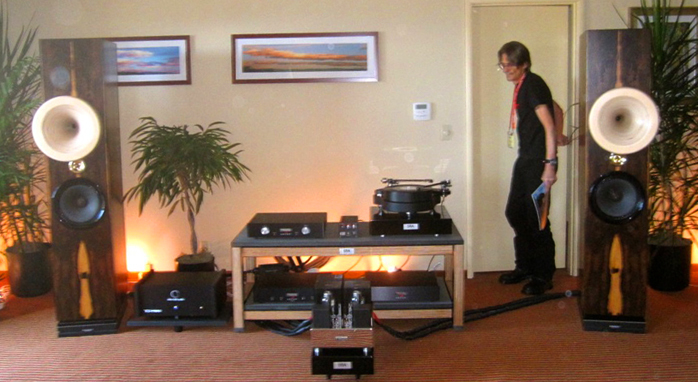 Robin Wyatt was an excellent host and gave a nice demo of several phono products using a VPI Classic 4 turntable. He played a mono record with a stereo Miyajima Shilabe stereo cartridge ($2.995) and then with the Miyajima Zero mono cartridge ($1.995) both on the same turntable by switching arm wands. The Zero mono cartridge clearly was richer and seemed to have more presence too. Robin also pointed out the Isoplat platter mat with the Ringmat Anniversary Gold Spot platter mat on top as important factors for the best sound with idler drive decks like the VPI Classic 4. The dc10audio Berlin loudspeakers with horn tweeter and bass ported through the horn somehow ($6.500/pr) were driven by the cute Tektron SET integrated amp ($3.950). Robin has represented Tektron for a number of years and cool about the amp is that you can hot-swap a variety of triode output types by flipping a switch. He switched between Sophia Electric Princess 206 and Psvane 300B tubes. The Princess 206 was clearly better with a beefier yet still refined sound. 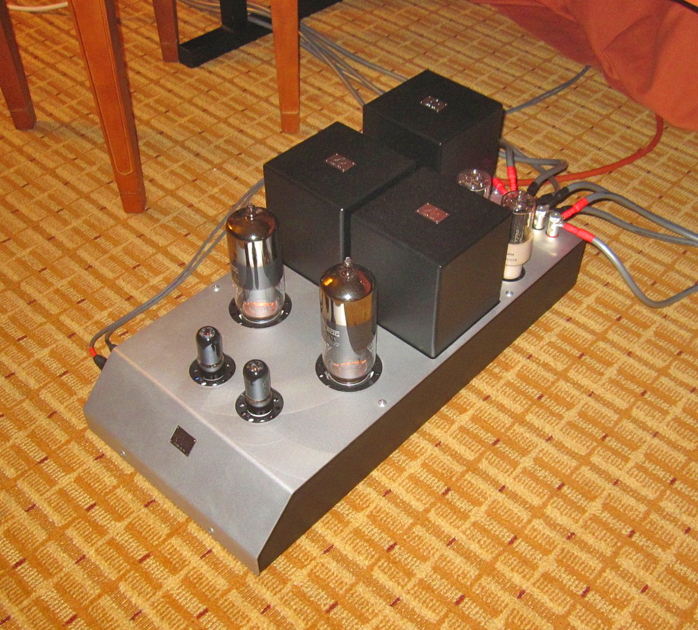 Robin feels that this 206 as well as the Psvane 300B sound better than even the original vintage WE 300B tubes. All I can say Robin, beware of Asian WE 300B worshippers. What a fun room! 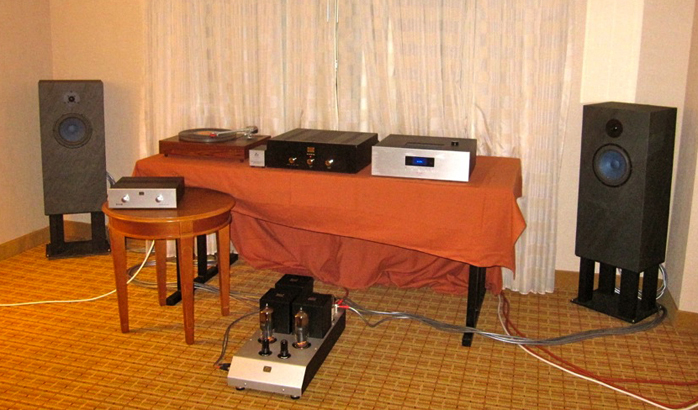 Analysis Audio, VPI Industries, Arion Audio, JPS Labs, Real Traps, EMM Labs, Chang Lightspeed. Time was running out and rooms were beginning to shut down for the end of the show. Dean and I popped into this room to take a quick pulse. I’ve heard these speakers every year and always liked them. 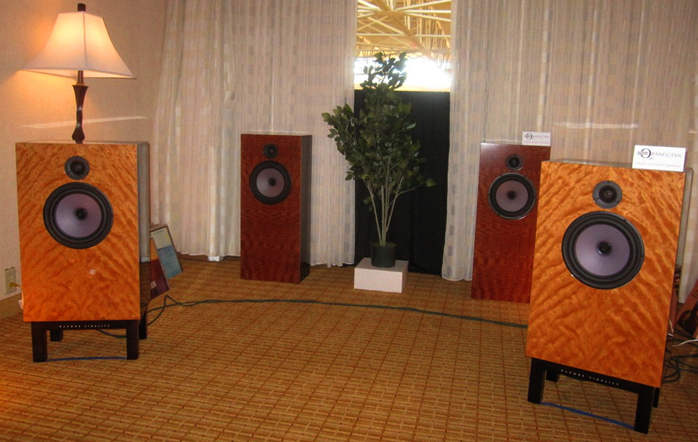 They were sounding fast and detailed but not as expansive as the much more expensive Leonardo planarmagnetic speakers. Still, very good sound. Most overplayed cut: Chris Jones, "No Sanctuary Here"